Autumn is a transformation beyond just the season. There are the obvious tell-tale signs that autumn is upon us in a change in the weather and changes in nature. The days become shorter, the rhythm shifts, the light and heat of summer subside. We move towards something more mellow and soft, which encourages us to look within and reflect. As you slow down, find the time to ponder an Ayurvedic approach to autumn. Ayurveda is a sister science to yoga, it’s the traditional Indian medical lifestyle system. The word ‘ayurveda’ translates as the ‘science of life’. The wisdom of Ayurveda is about finding a way of life that flows with the changes of the seasons, weather, time and place. Maybe you know your combination of the three doshas, vata, pitta or kapha. And maybe you know what triggers you out of balance. As a rule, we are a combination of doshas but it’s likely there will be a dominant one, I’m a fiery Pitta. But if you’re a Vata, Autumn’s erratic ‘winds of change’ caused by a predominant Air element in autumn will create lightness, dryness, and coolness. It will tend to aggravate you. Vata regulates the nervous system, the levels of moisture in the body, how relaxed we feel and how well we digest food. So breath becomes a key element of an autumn practice. 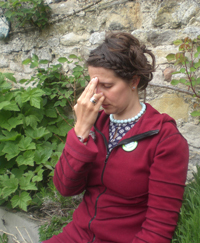 Traditionally in India, pranayama was taught in the two seasons of transition autumn and spring. What better time to master the art of breathing than in autumn, when there is such high prana in the atmosphere? You can feel the crisp, sharp, aliveness of the prana when you breathe. Clear a space in your day to try out a regular pranayama, why not hop off the bus a few stops early and simply clear out the lungs by taking a walk with awareness. Let your feet do the walking and allow your breath to become the focus of your walk. Or start your day with nadi shodan (alternate nostril breathing), helping to purify the channels of toxins, and especially vata-toxins that accumulate from tension and constriction of the channels. As you start to tune into your breath you begin a sort of landscape maintenance, pruning branches that are no longer useful and letting your leaves fall. Give a little love to your large intestine, as digestion is easily unsettled in Autumn’s excess air. It agitates the digestive fire, making it flicker. When your digestion is knocked out of balance, then the harmful toxin ama can start to build. Your meals should be cooked and ideally served warm, including your breakfast. Keep the following to a minimum – processed or fried foods, ‘windy’ beans and vegetables, cold, raw or dry food, such as cereals and crackers. Focus on foods which are sweet, sour and salty and reduce your intake of bitter, astringent and pungent tastes. Your asana practise could support the lungs/breath and intestines/digestion with some slow sun salutations savouring the breath, twists to cleanse the intestines, inversions and forward bends. A long savasana will help you feel grounded and to encourage a restful sleep. Simply by tuning into the natural shifts and changes of the seasons like this, we can adapt our yoga practices to keep us in balance. When we balance our lifestyle and practice we acquire the capacity to slow down, take on a little less and savour those autumn colours.